I have so much love for this story! My absolute favourite way to spend a rainy autumn afternoon is to curl up on the sofa with an audio book, and Year of the Guilty Soul was a real treat. Though only around two-and-a-half hours in length, short enough that I listened to it in one sitting, this novella manages to be both deeply thought-provoking and packed with emotion. Between them, A.M. Leibowitz’s gorgeous writing and Finley Smith’s soothing narration style had me captivated from start to finish. My heart really went out to Toni, the narrative’s teenage protagonist. During the year in which the book takes place, she has so many things to work through, from her mixed feelings about religion, to her confusion over her own sexuality and gender. I found her to be such a likeable character—sweet, gruff, intensely awkward—and it was impossible not to relate to her struggle. For me, Finley Smith’s husky voice suits her perfectly, so that it was as if Toni were right there in the room with me, speaking in my ear. Toni’s exploration of her bisexuality is especially well done. I liked the way the book is split into four parts, one for each of the seasons, so that we get to follow Toni through a year of her life as she turns from fifteen to sixteen. With every season that passes, she shares a kiss, and with each of these kisses—the sweet and the clumsy, the experimental and the touching—Toni inches closer to understanding herself and her attraction to both boys and girls. Another aspect I enjoyed was Toni’s large, quirky, widely diverse family. With her Jewish grandparents on one side, Christian grandparents on the other, and atheist parents in the middle, it’s little wonder she scarcely knows what to think when it comes to faith. Add into the mix an openly gay older brother, the younger brother who favours girls’ clothes, and the popular, outgoing sister, what you end up with is a colourful patchwork of personalities that I found fascinating. One thing that struck me with particular poignancy while listening to this was how much attitudes have changed over the past quarter of a century. I was born in the early eighties, and though I was too young to understand the terror and prejudice that surrounded the AIDs crisis, I’ve read a lot about it since. By 1991, when Year of the Guilty Soul is set, we’d realised HIV isn’t synonymous with the gay community, but the disease still engendered a great deal of fear and suspicion, something the author brings across with heartbreaking accuracy. 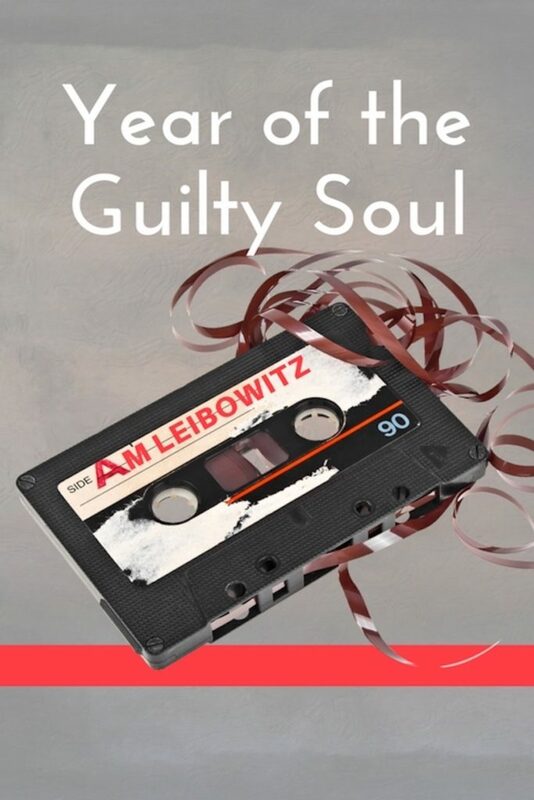 For its powerful writing, an immensely relatable heroine, and a compelling story told with warmth and humanity, Year of the Guilty Soul by A.M. Leibowitz gets 10/10 rainbows. The year is 1991, and Antonia “Toni” Moskowitz is caught in the middle, always having to pick a side. Whether it’s between her family’s two religions or in her relationships, she has choices to make. Does her heart belong to the outgoing boy with the lime-green nails or the girl in the black velvet skirt? Where does she fit in when both gender and gender roles feel confining? But learning who she is and who she wants to be with has a price. Every decision has consequences, especially when some kinds of love and expression are still taboo. Sometimes it’s hard to choose between being good and being right. Four seasons. Four kisses. One year to figure out what her heart wants. Download the audio book from Audible UK or Audible US! Next Post Celebrate the Release of Defensive Play and Enter to Win an Amazon Gift Card!